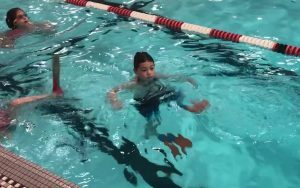 After Alan put on his flippers at swimming lessons today, he requested a video to prove how fast he can move through the water! 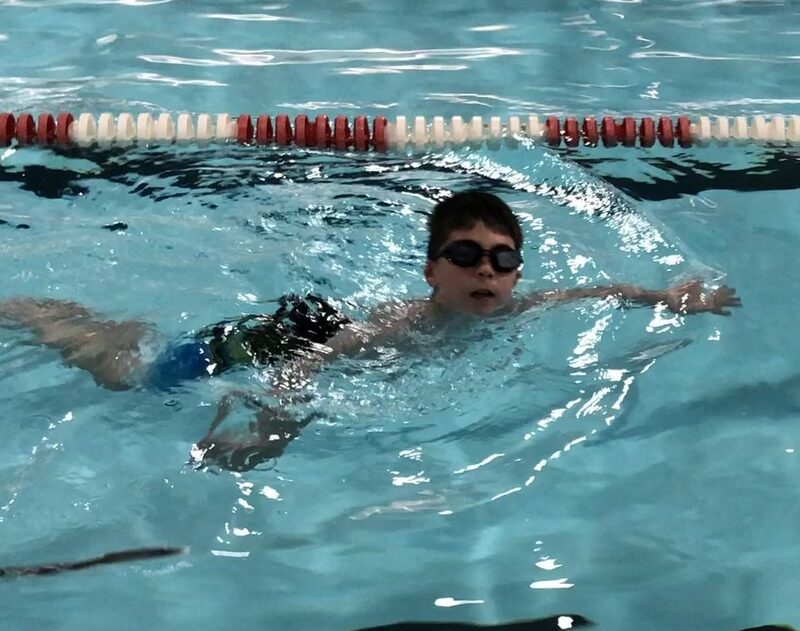 As of last Saturday, swimming lessons at Hawken are back on for the spring, and they run through May. Alan is still skiing on Sundays, too, for as long as Alpine remains open for the season. And up next in the sports calendar: Baseball in April! On weekends Alan loves to go to the Wildcat Fitness Center. 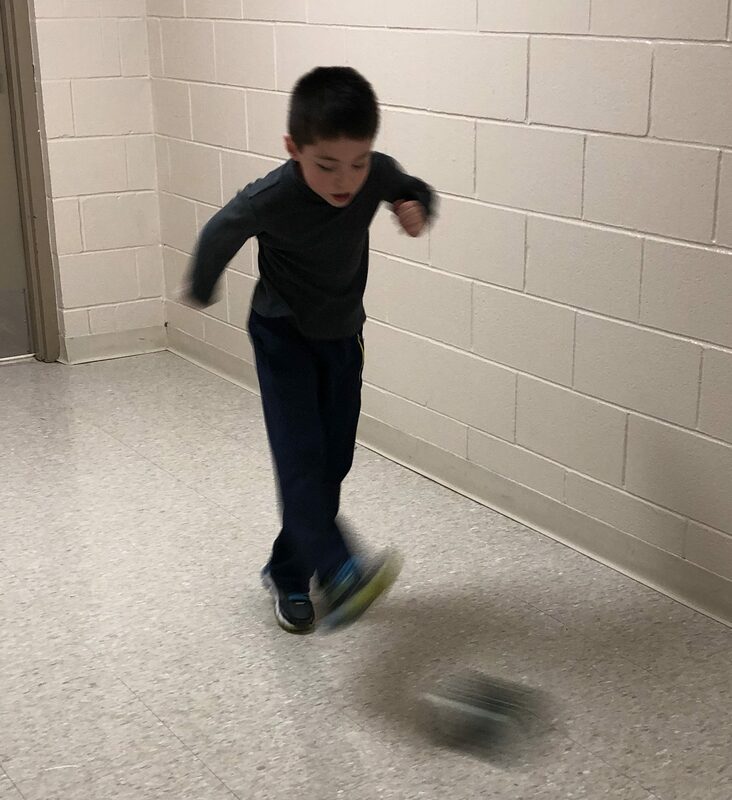 Recently he created a modified rules, 1-on-1 football game called “hallway football” that we both love playing. 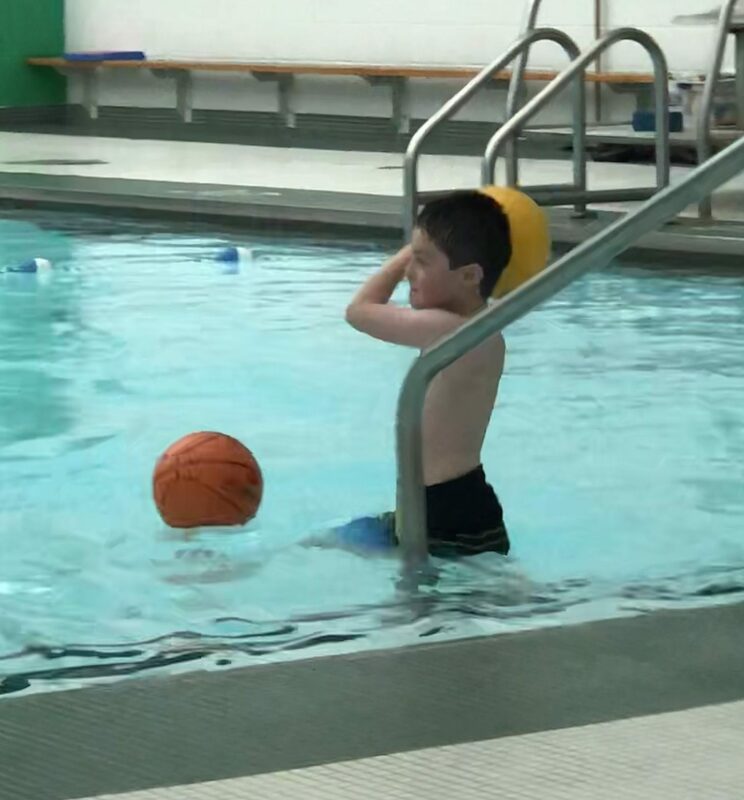 He also enjoys playing dodgeball in the pool. Tonight he got to play both! 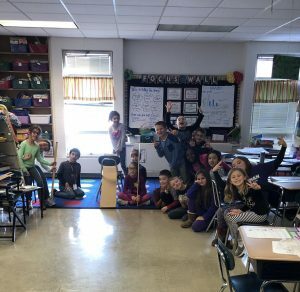 -Reading Dog Man books! After Alan was so excited to buy one of the books at the winter book fair, we ordered the other four books in the series. They arrived tonight and Alan couldn’t wait to start reading them! 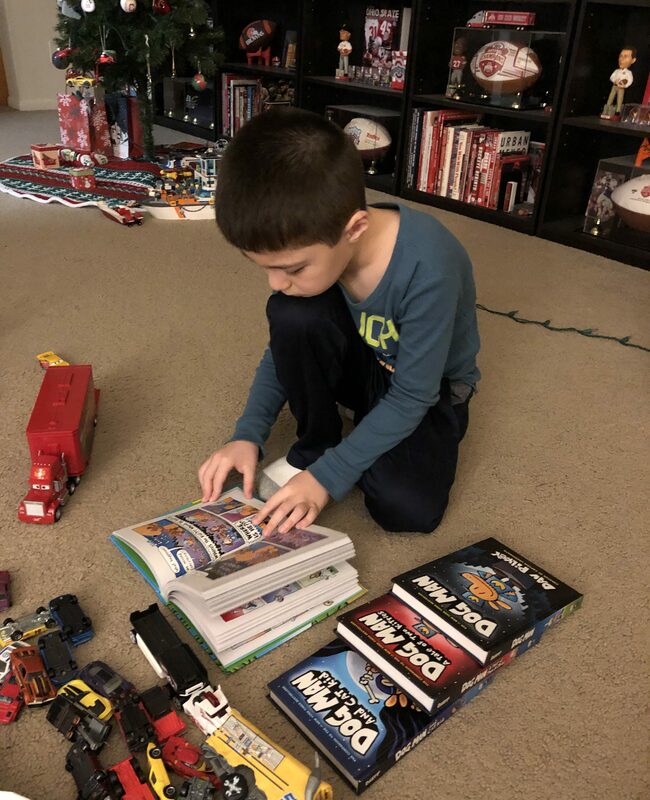 Some are being kept in his reading box at school, and others are being kept at home. -Decorating the apartment for Christmas. -Setting NFL match-ups with mini-helmets. Similar to what Alan did with baseball bats, he’s now pairing up football helmets to reflect weekly match-ups. He’s learned all the teams this year. 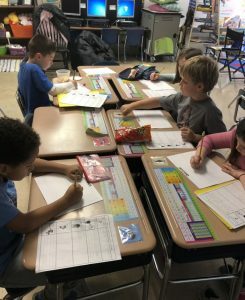 -Drawing pictures of race cars. Alan also recently bought “emoji” markers that he took to school to use with Brady to label race cars. He loves them. Both the Dog Man books and the new markers are a hit with his classmates! -Browns games. Alan has enjoyed following the Browns in addition to Ohio State this season. The Browns played this past Saturday night against the Broncos in Denver for a special Saturday night game. Alan followed on Gamecast as we drove from Luke’s house to Grandma Debbie’s. After the game ended on a Jabrill Peppers 4th-and-10 sack, Alan called me to celebrate. I loved getting that call from him! -“Lexia” sessions. Alan is up to Level 14 now. -Swimming at the Wildcat Fitness Center. I’ve been meeting Alan at the pool more frequently lately. -Science experiments at school. Gravity and motion have been two recent subjects. 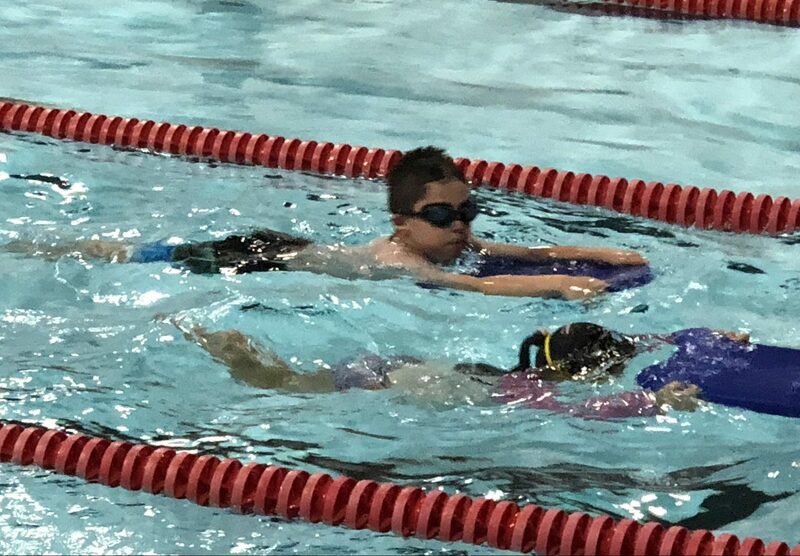 Today’s excitement included swimming lessons during the day and putting together Legos at night. Alan had one-on-one attention at the pool this afternoon due to some absences in his swim class. He swam back-and-forth and back-and-forth, compiling quite a few practice laps. 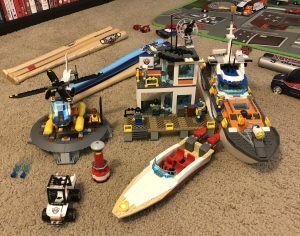 In the evening, Alan put his entire Coast Guard Lego set together! 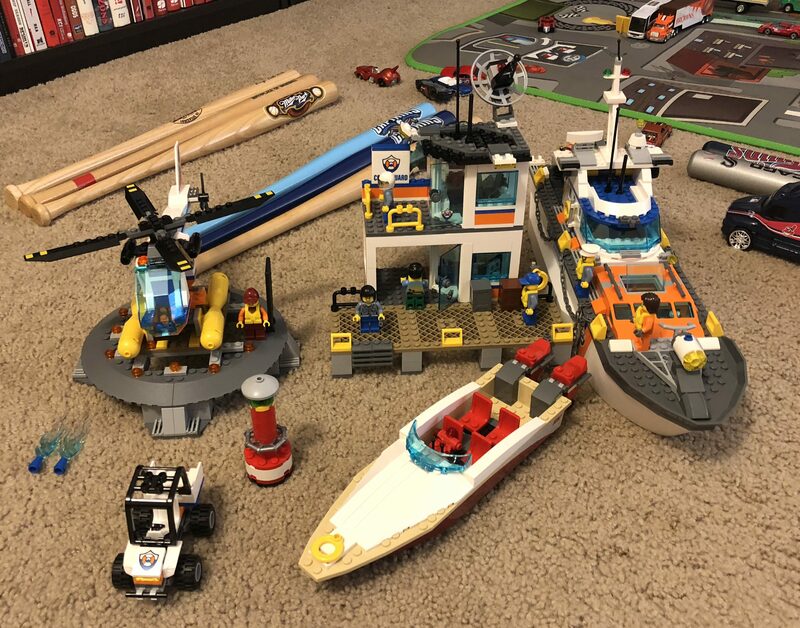 The set, which he got at his family birthday party, came in 8 separate bags. Alan just kept going and going and assembled the entire set while we watched the Ohio State football game. 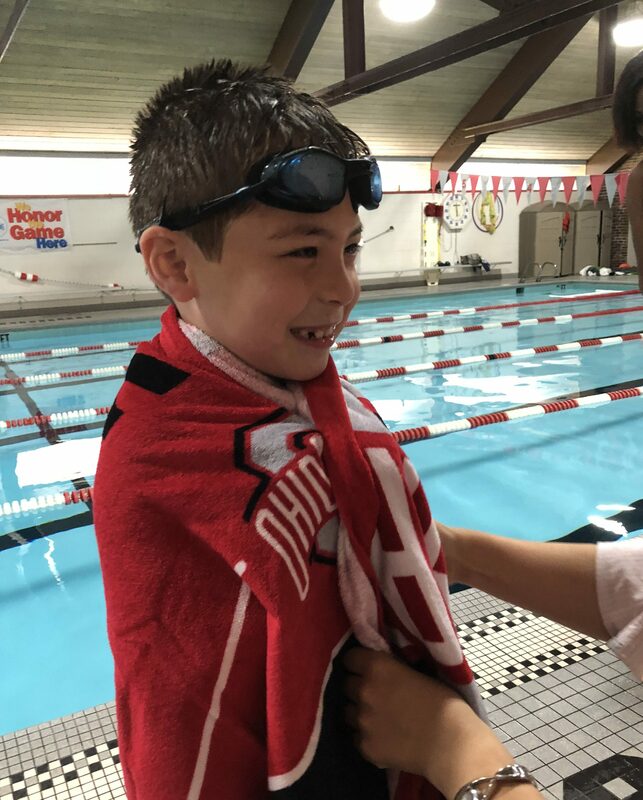 Not only did Alan enjoy his Legos, but he also got to see Ohio State rally to make up a 12-point deficit in the 4th quarter at Penn State to win 27-26! 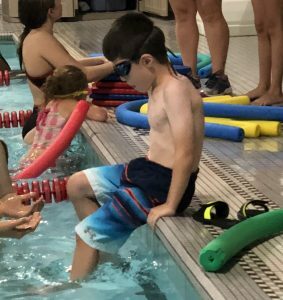 Although Alan’s been in swimming pools since he was a baby, today he attended the first session of his very first swim class. He’s signed up at Hawken Lower School, and the Saturday morning sessions run through October. He was nervous when he arrived at the pool today, but it didn’t take long for him to start having fun. He loved it and can’t wait for next week!